The great animals of Africa have long been under siege—once routinely slaughtered as trophies by big-game hunters, their habitats are now slowly being choked off by the relentless encroachment of human development, and increasingly the efforts to preserve them are hostage to the warfare that ravages the continent. In A Certain Curve of Horn, veteran journalist John Frederick Walker tells the story of one of the most revered and endangered of these regal beasts: the giant sable antelope of Angola, a majestic, coal-black quadruped with breathtaking curved horns over five feet long. It is an enthralling and tragic tale of exploration and adventure, politics and war, the brutal realities of life in Africa today and the bitter choices of conflicting conservation strategies. A Certain Curve of Horn traces the sable's emergence as a highly sought-after natural history prize before the First World War, and follows its struggle to survive in a war zone fought over by the troops of a half-dozen nations, and its transformation into a political symbol and conservation icon. 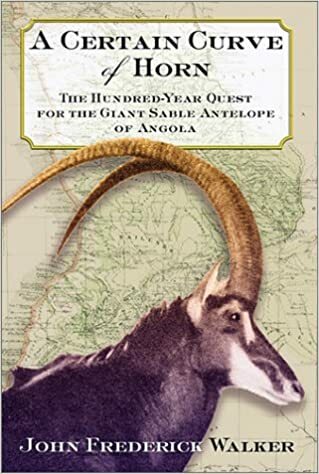 As he follows the trail of this mysterious animal, Walker interweaves the stories of the adventurers, scientists, and warriors who have come under the thrall of the beast, and how their actions would shape the course of the history of the giant sable antelope and the history of the war-torn nation that is its home. Culminating with a heart-pounding voyage into the heart of rebel-held Angola in search of the first scientific confirmation of the animal's existence in decades, A Certain Curve of Horn is a thrilling blend of history, natural science, and adventure—and a fascinating look into the world of a magnificent beast that has haunted the imaginations of hunters and naturalists around the globe for generations.